In the world of computers, the scanner is a device that optically scans images, printed or written text, a three-dimensional object, etc. representing it in a digital format. The now ubiquitous device can be found in offices as a desktop (or flatbed) scanner, where the document is placed on a glass window for scanning; in engineering and creative labs as a 3D scanner, used for industrial design, reverse engineering, test and measurement, gaming and other applications; in printing shops as a very-high-quality drum scanners, that are superior in resolution, color gradation, and value structure. Modern scanner may be considered the successor of early fax and telephotography input devices from 19th century. The first "fax" device was developed in early 1840s by the Scottish inventor Alexander Bain (1811–1877), who is primarily known as the inventor the first electric clock in 1841. On 27 May, 1843, Bain received a British patent (№9745) for improvements in producing and regulating electric currents and improvements in timepieces and in electric printing and signal telegraphs, and later made some improvements in his next patent (№10838), granted on 25 September 1845. 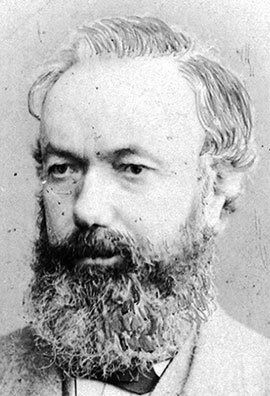 Alexander Bain (see the nearby image) was born on 12 October 1811 in the little town of Thurso, at the extreme north of Scotland, in the poor crowded family (he had six sisters and six brothers) of a crofter. Bain had a tough childhood and did not excel in school, but at the age of twelve he went to hear a penny lecture on science which, according to his own account, set him thinking and influenced his whole future. He was apprenticed to a clockmaker in Wick. Learning the art of clockmaking, Bain went to Edinburgh, and subsequently in 1837 to London, where he obtained work in Clerkenwell, then famed for its clocks and watches. In London Bain frequented the lectures at the Polytechnic Institution and the Adelaide Gallery and later constructed his own workshop in Hanover Street. Bain began inventing in 1830s, developing inkstands, ink holders, a ship's log and later many electrical devices, including various types of automatic telegraph, an electric clock, an earth battery, insulation for electric cables and an electric fire alarm for the army. 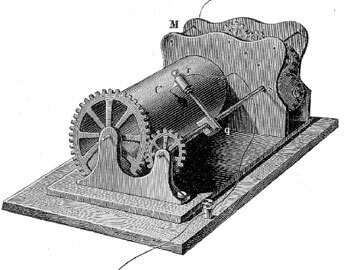 In his experimental facsimile apparatus from 1843 (see the nearby drawing), using his experience as a clockmaker, Bain used a clock to synchronize the movement of two pendulums for line-by-line scanning of a message. As a reading/writing device he used a stylus that was an electrically conductive swinging pendulum. As the pendulum swung back and forth across a raised image on a copper plate, electrical pulses are generated. 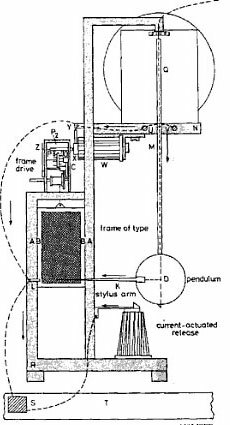 Besides that, each swing of the pendulum moved the copper plate to a small step so that the pendulum was able to scan entire plate surface. The electrical pulses were then sent across five wires to a receiving device, that also featured a pendulum. Its pendulum was synchronized with the sending device pendulum, which allowed the receiving side to generate an exact replica of the original image, using electrochemically sensitive paper impregnated with a chemical solution of ammonium nitrate and potassium ferrocyanide. In his patent description, Bain claimed that a copy of any other surface composed of conducting and non-conducting materials can be taken by these means, but actually his mechanism reproduced poor quality images and was not a viable device mainly because the transmitter and receiver were never truly synchronized. Bain's concept of the fax was somewhat improved in 1848 (British patent 12352) by the English physicist Frederick Bakewell (1800–1869), but Bakewell's device (see the lower patent drawing) also reproduced poor quality images. 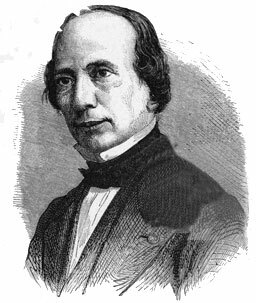 In 1846 Alexander Bain greatly improved the speed of telegraph transmission by using punched paper tape (nicknamed ticker tape because of the ticking sound the telegraph made) to send messages. This procedure will speed up the transmission of information very much. The punched paper tape was introduced by Bain on 12 December, 1846, when he patented so called chemical telegraph. He had seen that the Morse and other telegraphs then in use were comparatively slow, due to the mechanical inertia of their moving parts, and realized that the signal current could be used to make a readable mark on a moving paper tape soaked in a mixture of ammonium nitrate and potassium ferrocyanide, which gave a blue mark when a current was passed through it. Bain's chemical telegraph was tried in France between Paris and Lille, and attained a speed of 282 words in 52 seconds, a great advance on Morse's telegraph which could only give about 40 words per minute. Later it was used in England and USA, but never really entered general usage. The first practical operating electromechanical commercially exploited fax machine, the Pantelegraph, was invented in 1861 by the Italian physicist Giovanni Caselli (1815-1891). Made of cast iron and standing more than 2 meters high, this primitive to our mind, but effective machine worked as follows: The sender wrote a message on a sheet of tin using a non-conducting ink. The sheet was then fixed to a curved metal plate. The stylus of the transmitter scanning an original document by moving across its parallel lines (three lines per millimeter). The signals were carried by telegraph to the marked out the message in Prussian blue ink, the color produced by a chemical reaction, as the paper was soaked in potassium ferrocyanide. To ensure that both needles scanned at exactly the same rate, two extremely accurate clocks were used to trigger a pendulum which, in turn, was linked to gears and pulleys that controlled the needles. 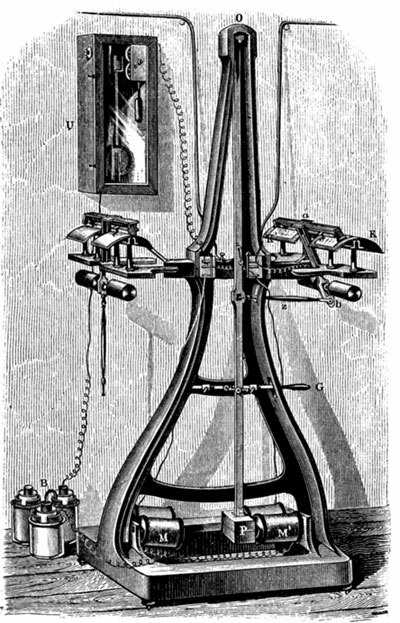 The first scanner developed for use with a computer, was a drum scanner (see the image below). It was built in 1957 at the US National Bureau of Standards by a team led by Russell A. Kirsch, working on America's first internally programmable (stored-program) computer, the Standards Eastern Automatic Computer (SEAC), in order to enable Kirsch's group to experiment with algorithms that launched the fields of image processing and image pattern recognition. By the late 1950s digital computers were in common use in many laboratories and commercial establishments. Originally, they were devoted exclusively to numerical, algebraic, and geometric computation. Later, the symbol manipulation capability of computers became recognized, leading to so-called business data processing in which alphanumeric processing became routine. The alphanumeric data presented an obvious problem of inputting the vast quantity of data needed for business. This created activity in developing character recognition machinery. 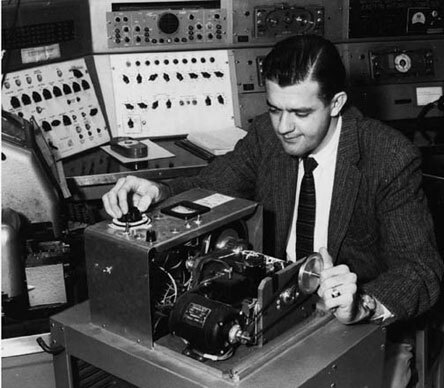 It occurred to Russel Kirsch that a general purpose computer could be used to simulate the many character recognition logics that were being proposed for construction in hardware. This would require an input device that could transform an image into a form suitable for storage in the memory of a computer. Voilà, the scanner was born. The SEAC scanner used a rotating drum and a photomultiplier to sense reflections from a small image mounted on the drum. A mask interposed between the picture and the photomultiplier tessellated the image into discrete pixels. 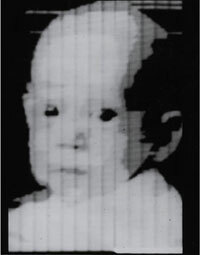 The first image ever scanned (see the nearby image) on the scanner was a 5x5 cm photograph of Kirsch's then-three-month-old son, Walden. The black and white image had a resolution of 176 pixels on a side. A further important advantage of building such a device was that it would enable programs to be written to simulate the various ways in which humans view the visible world. A tradition had been building in which simple models of human structure and function had been studied, for example, in neuroanatomy and neurophysiology. The emphasis on binary representations of neural functions led us to believe that binary representations of images would be suitable for computer input. This serious mistake was implemented in the first image scanner built. A serial-parallel converter (staticizer) was connected to the SEAC memory, enabling a stored image to be displayed on a cathode ray oscilloscope, thus making it possible for the researchers to see what the computer saw. And when they could see binary images, they realized the limitations of binary representation. So they experimented with superimposing multiple scans at different scanning thresholds and the use of time varying thresholds for pulse density modulation to represent multiple gray levels in an image.